The most famous Japanese writer of the modern era, and the one many people see as the father of modern Japanese literature, is Natsume Soseki, the author of such delights as I Am A Cat, Botchan, Kusamakura and Kokoro. However, before Natsume went on his miserable sabbatical to England and came back a changed man, there was another writer who visited Europe, returning to fuse western style with eastern sensibilities – Ogai Mori. 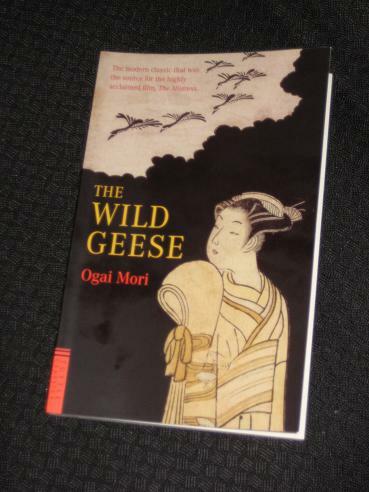 Mori was really the first of the modern Japanese writers, and his novel The Wild Geese (translated by Kingo Ochiai and Sanford Goldstein) is one of the best-known Japanese works of the early-twentieth century. Mori weaves the two strands of the tale – Okada’s growing interest in the mysterious beauty and Otama’s unfortunate history – together skillfully, the narrator later revealing that he had access to both sides of the story at different times, reflecting on events with the hindsight of thirty years of experience. The frame narrative is reminiscent of Victorian novels like Wuthering Heights (although the plot has more in common with The Tenant of Wildfell Hall), and the narrator has his own part to play in the novella. Things are no better for Sezuo’s actual wife, Otsune, though. While the miserly Sezuo is content to lavish money and gifts on his mistress and her father, his own family is kept to strict economy, a fact which probably irks his wife more than the suspected infidelity. Once she becomes aware of the rumours spreading around the neighbourhood (at a time when Tokyo was still more of a town than the megalopolis it has become today…), she confronts her husband, accusing him of keeping his own children in rags so that his lover can parade around in fine silk. This is on my wishlist already, just a matter of time before I enjoy this, hopefully as much as you. A little fact Soseki also wrote Haiku & was friends with Basho. This is a gem. It's got that deceptively simple yet beguiling prose. The more one reads J-lit, from Ogai to Soseki to Akutagawa to Tanizaki, etc., the more the “tapestry” becomes more exquisite. It sounds tremendous, and though I've read a reasonable amount of Japanese literature it's not one I already knew. I'll look out for it. I note Rize's mention of Tanizaki, an extraordinary writer. Japan has one of the great literary traditions (as does Hungary, but that's another comments thread).